The District 2 Pediatric Dental Program is one of the largest in the state and services are available to children up to 21 years of age who have medicaid or PeachCare insurance. Patients without insurance can also be seen on a fee basis. Children can be seen as early as 1 year of age for anticipatory guidance screening exams. Through a contract with the Ninth District Opportunity Head Start program, dental screenings and treatment services are provided to children accepted in the Head Start Programs in most counties within the district. Public health pediatric dental clinics are currently operational in Banks, Dawson, Forsyth, Franklin, Habersham, Hall, Hart, Lumpkin, Rabun, Stephens, and Union Counties. Contact the health department in the county nearest you for days of operation and to schedule an appointment. 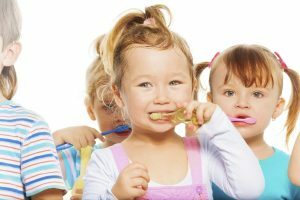 Why is Early Dental Care important? 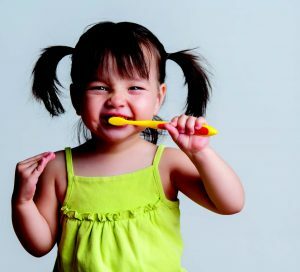 Oral health is important to the health and well-being of children, as well as being a vital component of health throughout life. A child’s teeth are susceptible to decay as soon as they begin to erupt. Baby teeth are crucial to holding space for permanent teeth so that teeth come in straight. In addition, baby teeth are important for chewing and maintaining good nutrition; speech development, especially tongue positioning and “lisp” prevention; facial structure development, support of the lips, and self image/self confidence. Dental caries is the most common chronic childhood disease. Tooth decay is five times more common than asthma and seven times more common than hay fever in children. Left untreated, pain and infection caused by tooth decay can lead to problems in eating, speaking, and learning. Children miss 52 million hours of school each year due to oral health problems, and dental problems distract children from learning and may lead to lower test scores. Every dollar invested in dental prevention saves as much as $147 in future expenses, and prevention can save up to $8,000 per child in corrective dental services. Studies have shown a link between oral disease and cardiovascular disease, diabetes, respiratory infections, and low birth weight. If left untreated, severe infections can lead to death.